There were lively exchanges in the European Parliament today as Tony Blair defended the weekend’s EU budget agreement before MEPs. Tony Blair received some stick but he gave as good as he got. Echoing John Major’s choice of words after 1991’s Maastricht Treaty, UKIP’s Nigel Farage said that it had been "game, set and match to President Chirac". Mr Farage told the Parliament that Mr Blair had "been outclassed and outplayed at every turn" by a French President who, unlike Mr Blair, had defended his nation’s interests. "Britain’s favourite newspaper, The Sun, says "Tony Blair is to surrender billions of pounds of taxpayer’s cash, and get nothing in return". In its editorial of December 1st, it says "This is treachery". Treachery, Prime Minister. Not a nice word. Not my word. The Sun’s word. But I and millions of Sun readers agree. You are giving away a huge sum of money, simply as a fig-leaf for your failure. But this is not your money, or the government’s money. It is our money. It is the tax-payers’ money. They say you are concerned about your legacy. Prime Minister, I can tell you what your legacy will be. You will be remembered as the man who squandered Margaret Thatcher’s legacy." A visibly angry Mr Blair told his critics that "This is 2005, not 1945… We are not fighting each other any more." Looking towards Mr Farage and Mr Helmer he said: "You sit with our country’s flag, you do not represent our country’s interest". Radio 4’s World at One said that the most prominent voice in support of the Prime Minister’s "deal" was EPP leader Hans-Gert Poettering MEP. He described the agreement as a "positive compromise". 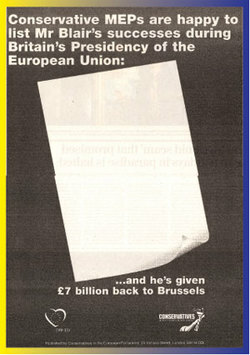 Underlining the contradictions within the EPP-ED grouping, the Tory MEPs used their share of the “Information Budget” to place an advertisement in The Independent attacking this "positive compromise". A scan of the ad appears on the right. The group of Tory MEPs are currently permitted to spend only a third of the Information Budget. The wider group controls the rest and used it to fund ‘Yes’ campaigns earlier in the year. Supporters of EPP withdrawal suggest that leaving the EPP will mean that Conservative MEPs will control all of the budget and have millions of pounds to invest in Eurosceptic campaigns over coming years. "In the current parliamentary term the 27 Conservative Members will hand over £2m from their information budgets to campaign for the EU superstate. If, as he claims, David Cameron really wants to be "consistent" he should leave the EPP before the end of the year, to halt a further €700,000 being transferred to causes his party claims it opposes."